When Bunkie Knudsen a high-level executive at GM left GM to take on the the helm at the Ford Motor Company in early-1968, he brought with him to Ford, one of GM’s most legendary designers, Larry Shinoda. Two of the most icon automotive designs to come from GM, the 1963 and 1968 Chevrolet Corvettes where created by Shinoda. When he arrived at Ford, the restyled and revised 1969 Mustang was in its final planning stages. Knudsen gave the task to Shinoda to add his design flair to a new Mustang model that would showcase a new high-performance version of Ford’s Windsor family 302 cubic inch V8. This new Mustang competed directly with the 1969 Chevrolet Camaro Z28 which was equipped with a high-performance Chevrolet small-block 302 cubic-inch V8. This competition was not only a rivalry on the streets, it was a rivalry on the Trans Am racing circuit. Though the basic shape and lines of the 1969 Mustang were already set in stone before Shinoda showed up at Ford, he was able to add his personal touch to the performance-oriented 302 powered Mustang. The official name was the Mustang Boss 302 but many refer to it as the “Boss 302 Mustang”. Shinoda also designed the 1969-1970 Mustang Boss 429 and 1971 Mustang Boss 351. However among Ford fans it’s the Boss 302 Mustang that he’s most remembered for creating. 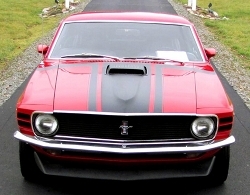 The 1969 Boss 302 Mustang used the 1969 Mustang SportsRoof body style which was Ford lingo for the fastback body style. Shinoda didn’t like air vents found on the rear quarter panels of the fastback 1969 Mustang Mach I, so they were absent on the Boss 302. The Boss 302 had as standard unique dual side stripes, a black hood, a black decklid, a chin spoiler, and a set of 15×7-inch Magnum 500 wheels with Goodyear F60x15 Polyglas tires. The front grille, the area around the front headlamps, and the rear taillight panel were all blacked out. All this solidified the Boss 302 as the most serious looking performance Mustang for 1969, it was macho through and through. Even the best of muscle cars from this time period couldn’t come close to replicating the Boss 302’s perfect low and wide stance. Where most vintage muscle cars had tires trapped inside the wheel wells, the Boss 302’s tires were bulging out of the wheel wheels just like a true race car. Optional were black rear window louvers and a black rear wing spoiler. As great as the exterior styling was, it was the free revving small-block 302 V8 called the Boss 302 V8 which made the Boss 302 Mustang stand apart among all other Mustangs. Unlike the other Ford 302 V8s of this time period the Boss 302 was the only 302 V8 to get a 4-bolt main block. The Boss 302 was higher in nickle content and was a better fortified engine block than the regular 302 engine block. 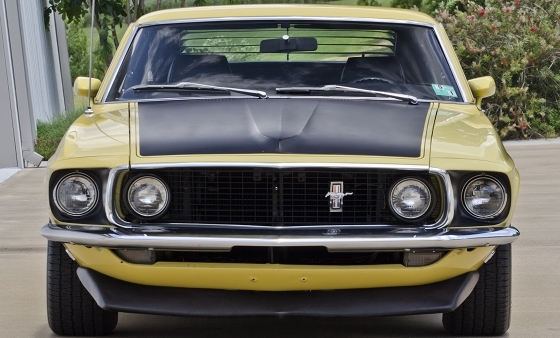 The Boss 302 had the 351 Cleveland’s free-flow heads, which would debut on the 1970 351 cubic-inch Cleveland V8. The Boss 302 had numerous performance goodies that made it a genuine race motor for the street. The Boss 302 had a 10.5:1 compression ratio, a Holley 780 cfm carburetor, a freeflow intake, and dual exhausts. Official power output from the factory was rated at 290 gross horsepower at 5,200 rpm. 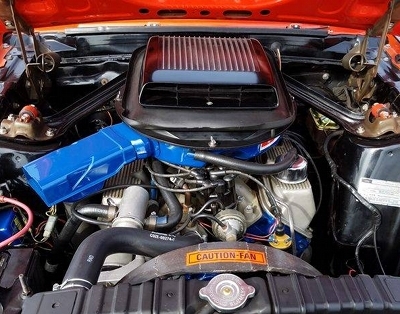 Since the Boss 302 could easily rev to 8,000 rpm and beyond if one wasn’t careful, Ford made mandatory a small rev limiter box inside all Boss 302 Mustang engine bays. It was a safety measure when left in place ensured owners didn’t over-rev their 302s and blow engine internals to smithereens. The limiter limited revs to a maximum of 6,250 rpm. All Boss 302s had a 4-speed manual transmission. Since the Boss 302 was a pseudo race car for the streets due to its low displacement and high rev nature, it was very light on torque. Peek torque was 290 lb-ft at a very high 4,300 rpm. Even with the Boss 302 not being an off-the-line tire shredder, it still managed a very impressive 6.9 second 0-60 mph time and 14.6 second quarter mile time at 98 mph. These times proved the small-displacement Boss 302 could go toe-to-toe with many great classic muscle cars which had 400 or larger cubic inch V8s. The Boss 302 Mustang was a well rounded performance car that foreshadowed future American performance cars in that it placed just as much emphasis on handling as straight line performance. The Boss 302’s suspension, fat tires, and light small-block V8 engine over its front wheels made for a good handling car. Add to that standard front disc brakes, larger anti-sway bars, and tight steering. It was easy to see how the Boss 302 Mustang was made for the track. For 1970, the Boss 302 Mustang returned. It had the same factory horsepower and torque ratings as 1969. 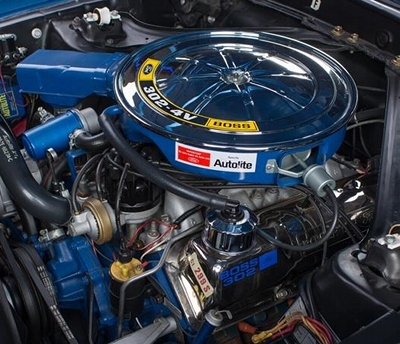 The 1970 Boss 302 V8 now had aluminum valve covers which replaced the previous year’s chrome valve covers. Other changes included smaller intake valves and a revised dual exhaust system. The big surprise was a new optional forward-facing shaker hood scoop which fed cold air into the engine. The scoop was directly mounted to the engine and protruded through a hole in the hood. It was a $65 option which was a bargain considering how it improved wide-open throttle sound and complimented the great looks of the Boss 302 Mustang. If a buyer didn’t opt for the shaker hood scoop, a flat hood just like the one found on the 1969 Boss 302 Mustang was what a buyer got. Most standard items and options carried over from 1969 to 1970 with only a few minor changes. The biggest change was a revised exterior decal scheme. The front headlight and grille area of the 1970 Mustang was also redesigned. The four headlight design was replaced with a new two headlight design theme. There was a new rear taillight design which had the vertical red lights now recessed. New 15×7-inch steel wheels with dog dish hubcaps and trim rings were standard for 1970, 15×7-inch Magnum 500 wheels were now optional. Where muscle car sales were way down for 1970 due to high insurance premiums, Boss 302 Mustang production was way up. 7,013 units were produced for 1970 versus only 1,628 units for 1969. 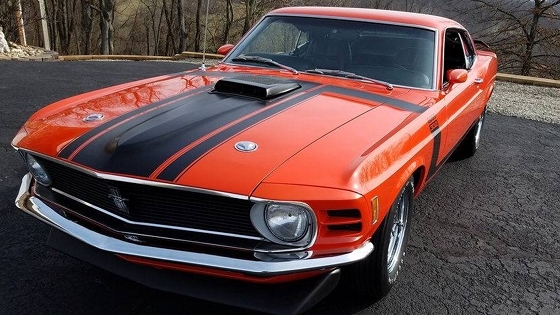 The Boss 302 Mustang was a real winner. Unfortunately this sales victory was short lived, for 1971 the Mustang would receive a new body style and the Boss 351 Mustang would replace the Boss 302. The Boss was gone by 1972. Ironically the Mustang Boss 302 would return to production for the 2012-2013 model year. Another high-output version of the 302 cubic-inch V8 in the 1980s would become Ford’s hottest performance engine starting in 1982 with the return of the Ford Mustang GT. For this return, Ford even had an ad campaign declaring “The Boss Is Back”. The sad aspect of this story is that Ford wasted 11 model years by not offering a high-performance version of the 302 V8 in its Mustang from 1971-1981. From 1974-1981 the best Ford could muster was a low-compression low output 2-barrel carbureted 302 V8 which produced no more than 140 horsepower. Ford just gave up during this time period. 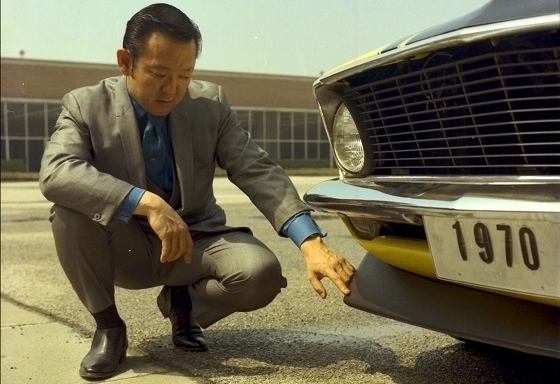 Shinoda left Ford in late-1969 never to return. Perhaps if Shinoda had stayed at Ford during the 1970s, the Boss 302 Mustang could have continued and done battle with the Pontiac Trans Am and Chevrolet Camaro Z28. If this had occurred throughout the 1970s, Ford could have given the Mustang name the honor it deserved, and not the underpowered Mustang II and early Fox bodied Mustang, it instead gave Mustang buyers. Unfortunately Shinoda passed away in 1997, but the legacy he created surrounding the “Boss” name still lives on. The 1969-1970 Mustang Boss 302 will forever be known as Shinoda’s masterpiece. « 1970 AMC Rebel Machine – Don’t Mess with the Machine!